Composer Steve Reich, often thought of as the father of American minimalism, has famously scoffed at the nomenclature of the sub-genre he ostensibly created. His argument undermines the notion that music without melody or crescendo is somehow “less than” compositions created largely in service of those things. 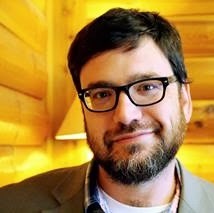 Approached differently, his argument suggests that music like his – textured repetition of drones and a-tonal rhythms – is not offering minimized aspects of conventional music so much as it is relying on the listener to find depth, melody, and the stuff of “maximal” music in unlikely places. Reich’s rejection of minimalism as a “team name” suggests that a comparison of less and more is the wrong way to frame the sub-genre and its relationship to the larger genre of classical music that it is working in and against. Minimalism certainly isn’t the only sub-genre to end up with a moniker implying that so-called work is missing something essential to the art form. Abstract or non-representational art – or, in the case of Gareth A. Hopkins’ ambitiously bleak The Intercorstal: Extension, abstract comics – is also named in such a way that suggests one should not expect it to do the things that art is often thought to be for, namely representing the world as it is. It is worth acknowledging the utility of such nomenclature: thought of most generously, such language serves as a briefing for potential readers regarding the kinds of experience they should expect to have by suggesting that the ways one evaluates a block of color or a matrix of dots should differ from the way one considers a painting of a sunset or airplane crash. Along these lines, it’s worth considering that Hopkins embraces the title and describes The Intercorstal as an abstract comic, a self-definition that perhaps calls into question my choice to think about abstraction in the context of Reich’s rejection of his minimalist tag. 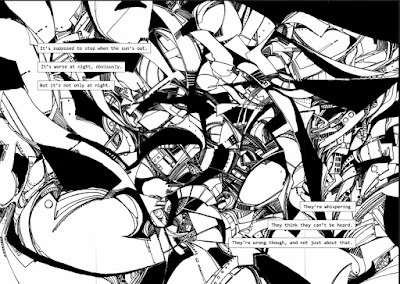 And yet, experiencing the series of two page layouts comprised of stills and monochromatic patterns that negotiate stark paradoxes – motion and stillness, connection and isolation, negative space and compact, busy loci – one might wonder if the best way to demark this work from the larger genre of comics really has to do with abstraction and a lack of representation. Put another way, it is hard to imagine a comic that more accurately represents what this particular political and cultural moment feels like. Defenders of abstract art as a meaningful demarcation would likely suggest that such a sentiment is splitting hairs because such art works to represent abstract concepts, ideas, or feelings; this may be true, but how abstract, really, is the feeling of time stopping after one loses control of a vehicle on ice or realizes one is in a cockpit of a plane that is inevitably going to crash? My focus on nomenclature is perhaps misguided, but the fact remains that critics and readers often conflate abstraction – and minimalism for that matter – with a lack of precision; The Intercorstal: Extension is exceptionally precise. Even if Hopkins describes a process in which improvisation and accident play a large role in the creation of the two-page spreads that drive his work, the results suggest a specificity and rightness that belie the sense that anything about this work is abstracted. For this reader, the real difference between this comic and more conventional work is not about the relationship between the image and the world but about the relationship between the image and the role of the author. 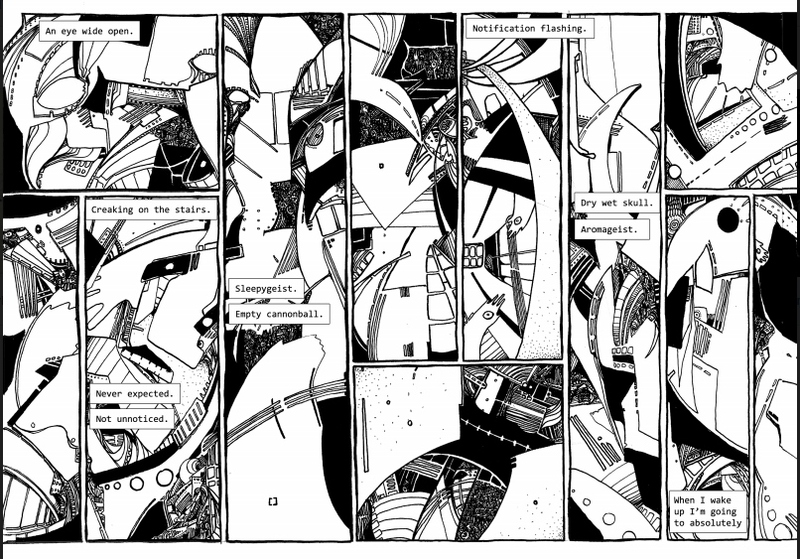 If conventional comics use panel layout to sequence images in such a way that the gaps between panels invite a reader to connect them according to narrative logic, The Intercorstal seems to live in and expand the in-between space; one might think about the intercostal spaces between one’s ribs. This liminal effect does suggest that one shouldn’t approach these images looking for story, but it also suggests that these images are somehow created but un-authored, begotten not made, drawn from an automatic space where what we are getting has not been filtered according to a narrative drive belonging to someone attempting to say something. This is not to say that the art of The Intercorstal is without subject. However, shapes and patterns – one might be reminded of Richard Case’s backgrounds in Doom Patrol – are more significant than any objects a reader might recognize in a panel. The visual language of The Intercorstal is that of aggregate data, the visual world as a sum total; most of the images are composites built from human-made angles and shapes evoking skylines and cityscapes and airplane cockpits as well as human hands and clown faces, presenting them kaleidoscopically as if such things were as natural (or abstract) as a beaver dam or pattern in a honeycomb. To the extent that The Intercorstal’s visual lexicon is abstract, it is so not because it has no reference to things in our world but because all of those references collapse upon each other. We see the world all at once but, somehow, a panel at a time. Where The Intercorstal’s visual idiom creates dissonance between itself and the world we know by overloading each panel with potential signifiers, the comic’s use of text is much more, for lack of a better word, minimalist, built from short sentences and fragments. Like the comic’s visual arsenal, these utterances do not obviously refer to a specific subject matter. However, unlike the comic’s use of imagistic overabundance, the spare verbiage does create a recognizable subject matter through the use of negative space. Lines like “Dust floating in the light,” “and “Give the pipes the blame” both offer potential rationalizations of the unexplainable or paranormal. “It’s worse at night, obviously,” suggests that the comic is about how one hears or tries not to hear ghosts. 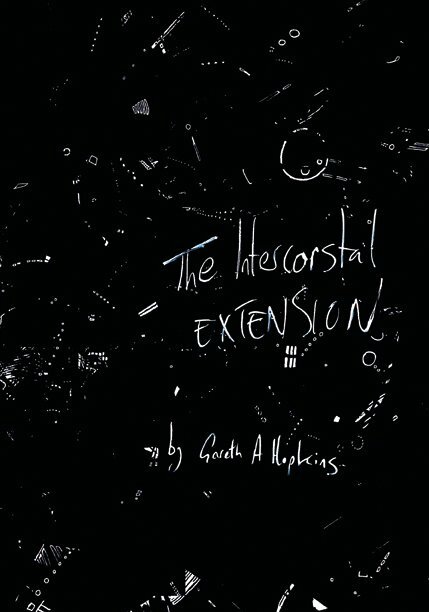 The Intercorstal is about the process of hearing the nefarious in the mundane – or the melodic in the minimal – and the power of subjective reception. It is ultimately a listener’s decision whether they are hearing ghosts or pipes, music or noise, minimalism or something else. Set against images that are both kinetic and frozen, functioning according to a physics that is not in service of an authored narrative, the result feels like an observation of our current world freed from the notion that it should make sense. Again, one might be reminded of the Morrison run of Doom Patrol; however, the tension in that comic had to do with a superhero team trapped in a genre in which they were obligated, at least at first, to fight the forces of chaos and disorder. Here, the disorder is rendered as value-neutral; if a reader is ultimately always responsible for making meaning, what really is the value difference between meaning and meaninglessness? Such a description, again, sounds abstract. However, a rendering of the chaos created by human attempts to forge and expand order into a disordered universe is actually a depiction of a hyper-specific subject: it is the removal of the values created by the assertion that the world is a complex place that is disorienting. 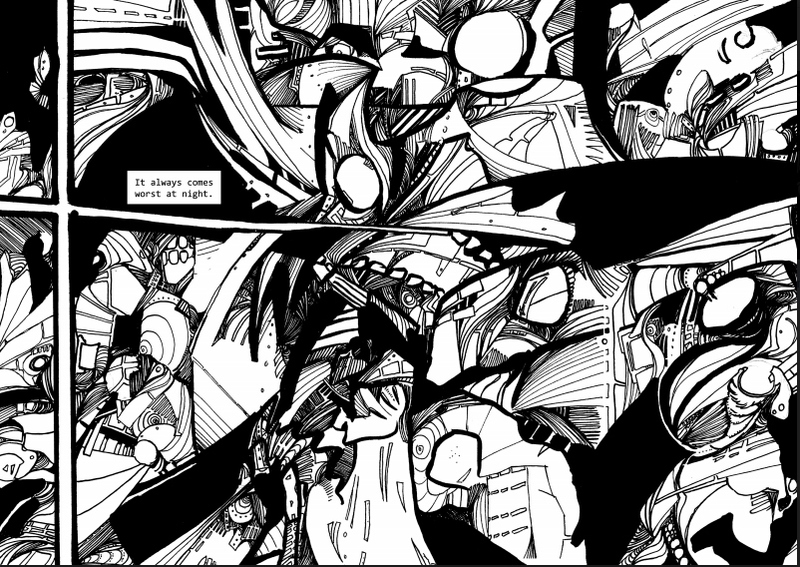 Accordingly, the comic – though black and white – creates its patterns out of the binary by refusing to work with value; there are no grays here that imply the translation of a multi-colored world into black and white. There is only presence and absence, form and void. 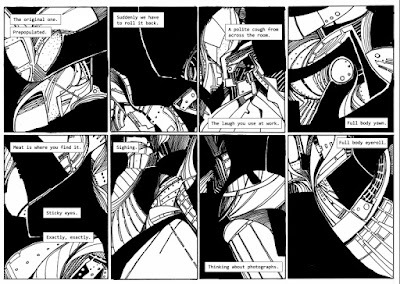 This resistance to value is thematically in line with a description of The Intercorstal: Extension as being about disorientation or de-familiarization and the representational world, but it is perhaps a paradox to find a stark binary at the heart of a comic with a titular ambition to exist in the in-between. It is worth noting here that patterns of alternated form and void invite the reader to understand an image as having value; one perceives fine black and white lines as grey even if the values at work are only one and zero. A perhaps unrelated Google of “corstal” reveals that it was the name of a mineral in Forgotten Realms. Though one cannot be certain that Hopkins is referencing this material, it seems relevant that the mineral is most noteworthy for retaining proximal light and glowing after exposure. In other words, something that is “inter-corstal” would exist between the spark and its echo. That space, between energy and a material preservation of that energy, perfectly describes where this comic lives; even if I am over-reading here, this is a comic that, to mind at least, is about how we (over)read and (over)understand the world. However, none of that undoes the fact that the underlying world is terrifying and worst without the light that allows us to see it at all.